This lesson describes the last preliminary step in developing the Wish List application, that of creating a sample database with test data. To complete the steps in this tutorial, you will need a database in which to store data of wishers. With the NetBeans IDE you can perform all these activities through the IDE interface. Before starting, see the tutorial requirements described in Creating a CRUD Application with PHP - Main page. The current document is a part of the Creating a CRUD Application in the NetBeans IDE for PHP tutorial. 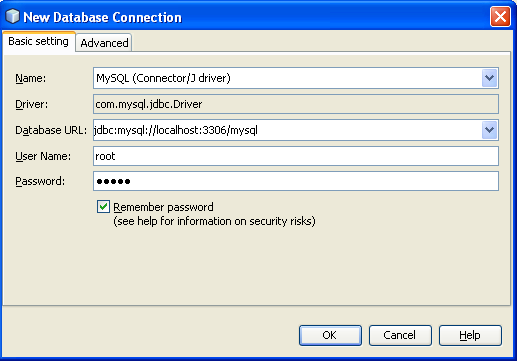 If you do not have a MySQL database server registered in the IDE, or you want general information about using MySQL with NetBeans IDE, see Connecting to a MySQL Database. Connecting to the MySQL server as the root user. Connecting to the MySQL system database as a root user. This step is necessary to enable running an SQL command for creating a user because you cannot run an SQL command without being connected to any database. Executing a user creation MySQL statement. Start the IDE, switch to the Services window (Ctrl-5), and expand the Databases node. To execute an SQL command, you need to be connected to a database. Because only the MySQL system is available, you need to connect to it. To connect to the system database, navigate to the mysql node and from the context menu choose Connect. If a connection does not already exist, the New Database Connection dialog box appears. The User Name field is by default filled in with root. In the Password field, enter the root user’s password. *Note: *If you have connected to the mysql database before, this dialog does not appear. Instead, the new connection node simply appears in the tree. From the context menu, choose Run Statement. If the command is executed successfully, the Status bar shows the message: "SQL Statement(s) executed successfully". If another message is displayed, check the syntax and follow the message hints. In the Database Name field, enter wishlist. The "Grant full access to user" function does not always work. If it does not work, connect to the database as the root user and send the SQL query [examplecode]# GRANT ALL ON wishlist. * TO phpuser@localhost #. A connection to the database appears in the tree. However the connection is for the root user. You need a connection for the` phpuser` user. At the end of the previous section, you created the wishlist database with a connection to the root user. Now you create a new connection for the phpuser user. In the Database field, type wishlist. The corresponding new connection node is displayed in the Databases tree. Now you can delete the root user’s connection to the wishlist database. Click the jdbc:mysql://localhost:3306/wishlist [root on Default schema] connection and choose Delete. wisher_id - the ID of the wisher to whom the wish belongs. The field is used as the Foreign Key. The tables are related through the wisher’s ID. All the fields are mandatory except due_date in wishes. To connect to the database, on the jdbc:mysql://localhost:3306/wishlist connection, click the right mouse button and choose Connect from the context menu. NOTE: If the menu item is disabled, you are already connected. Continue with step 2. From the same context menu, choose Execute Command. An empty SQL Command window opens. You can get a unique auto generated number from MySQL by specifying the AUTO_INCREMENT property for a field. MySQL will generate a unique number by incrementing the last number of the table and will automatically add to the auto incremented field. In our example the ID field is auto incremented. 2. Click the right mouse button on the query and then choose Run Statement from the context menu. *Note: *The default storage engine for MySQL is MyISAM, which does not support foreign keys. If you want to use foreign keys, consider using InnoDB as the storage engine. Click the right mouse button on the query and then choose Run Statement from the context menu. To verify that the new tables are added to the database, switch to the Services window and then navigate to the jdbc:mysql://localhost:3306/wishlist connection node. Click the right mouse button and choose Refresh. The nodes wishers and wishes appear in the tree. Note: You can download a set of SQL commands for creating the MySQL wishlist database here. To test your application you will need some data in the database. The example below shows how to add two wishers and four wishes. On the jdbc:mysql://localhost:3306/wishlist connection, click the right mouse button and choose Execute Command. An empty SQL Command window opens. Select the queries, click the right mouse button on each query and from the context menu choose Run Selection. You can also execute the queries one after another as described in item 2. To get some general understanding of database principles and design patterns, check the following tutorial: http://www.tekstenuitleg.net/en/articles/database_design_tutorial/1. For more information on the syntax of MySQL CREATE TABLE statements, see http://dev.mysql.com/doc/refman/5.0/en/create-table.html. For more information on inserting values into table, see http://dev.mysql.com/doc/refman/5.0/en/insert.html. To send comments and suggestions, get support, and keep informed on the latest developments on the NetBeans IDE PHP development features, join the users@php.netbeans.org mailing list.